I know this is the sort of thing that would have been much cooler for most of you (particularly anyone reading this who doesn't speak Russian, which is probably most of you) if I had done this super-lo-fi-recording-of-me-singing-and-playing-guitar style. However, my guitar's on another continent, and I have not (yet) used my time to figure out how to play this, uh, ... masterpiece of 80s pop culture? Yep. You guessed it. I translated the Culture Club's 'Karma Chameleon' into Russian. Group picture with the moose sculpture. If you take your picture with the moose, you will be smarter and happier for the rest of your life. Plus, you also have a photograph of you with a big moose. Bargainous, indeed. Top to bottom left to right: large moose, Amber, Stephen, Elya, Tess (in the Vassar sweatshirt), Emily, me, Lauren, Emma (in yellow), Rebecca, Tatya, Liza, and Adams. I found ZZ Top graffiti! This is not Russian architecture. It is Swiss, built back when the Swiss owned these parts. Which was a ways back, but still. There's a lot of not-Russian architecture in Vyborg. A bear. A Russian bear. That there is the light of God, shining on that church. You better believe it. More non-Russian architecture. Looking a little German, no? Could be Dutch, I suppose. I know nothing. The extent of my untraveled self's knowledge of European architecture is derived from Epcot. My memory of Epcot, at that. Which was a trip that happened about 10 years ago. Me and Emily, in some ruins. This is the most romantic street in Vyborg, according to our awesome old pensioner of a tour guide. We went up in a tower, and you could see for about 30km. Taken from the bridge outside said tower. We spent the afternoon in the park, which is where this was taken, and it's one of my favorite pictures of the trip so far. A tree, with lots of roots. Where's Liza? Sky picture! The weather was gorgeous, if you can't tell by lookin' at them fluffy clouds. Lauren. She went swimming, and then, like the other folks who went swimming, had a nice time drying off in the sun. Conclusion: Vyborg: best excursion yet. Small cathedrals. There were several of them in this one area. This church in particular, several of the young women ran around three times, in order that we might one day have good husbands. As opposed to bad husbands, I guess. Running around it seemed like a good precaution to take. Bridge in Novgorod. The Kreml is on the other side of the bridge. Also on the other side of the bridge, a very nice beach. This image kind of struck me. This girl was standing there (I assume she was waiting for someone) and had no idea how close she was to that graffiti. We spent a good deal of time just walking around this statue, while our tour guide told us about all of the important people in Russian history that are on it. I'm not that into large informational statues; I had a hard time paying attention. Again, if I'd taken more Russian history, I would have gotten more out of it. Well, except for the it being a statue part. This is an old church in Novgorod. I forget how old. Older than you great great great grandparents' ancestors, probably. You can see that there used to be these large icons painted on the front of the building, but time has worn a lot of it away. Aaaand, some of us went swimming. Some others built a sandkreml. Then the "Mongols" attacked. In the form of our friend Sasha, mainly, as I recall. This is the little church in the monastery we visited on our second day in Novgorod. A monk came out and talked to us. He told us about how a church is like a classroom, and how while we are there we are preparing for a large exam, and that while we're busy with our everyday lives, we shouldn't forget about this exam, too. I'm not sure how the other students took it, but I appreciated it: I felt like many of the monasteries and churches we had visited we were treating like tourist spots. It was neat to go see this monastery and feel a stronger connection to the spiritual life that is alive there, without feeling like I'm intruding on anyone's worship. He also told us about the drug rehabilitation program they have at that monastery, while is astronomically more successful than the numbers for the state as a whole. It has occurred to me that I might have told you about this before, without pictures. If so, well, I can't remember. Then, we found this large wooden post, with some ropes attached. It's kind of like tetherball, except instead of hitting one ball around on a string, four people swing around on ropes. It's awesome. It really shows how some of the most fun things in the world have absolutely nothing to do with technology. So, here are some people I know, swinging around and knocking into each other. First, we have Louis, Emma (both Obies), possibly Megan (I can't tell), and Adams. Me, losing control of my momentum, and Megan. You can't see Erica in this picture, but imagine that I swing toward you, and then knock into her, because her rope is slowing down and mine is so not. The Russian tutors! Vika, Tatyana, Christina, and Elya. Oh goodness, I hope those names are correct. A good bit on Vyborg, and not very much on Novgorod. Yesterday, I left my house at 6:55 in order to catch a 7:40 train. I ended up leaving much later than I intended to, and needed to take the metro to the train station. As I may or may not have mentioned, my host family lives about 15-20 minutes away from the nearest metro station on foot. So for the first time by myself, I flagged down a car and paid a guy 100 rubles to take me to the metro station. (Don't worry - that's completely normal in Russia.) Anyway I got there in time for the days's excursion. After a two hour train ride, we arrived in Vyborg (vui-berg), which is an older town on the Baltic coast that's got a history including both Russian and Scandinavian ownership. Consequently, it's much less heavy on the Russian architecture than Pskov or Novgorod or Petersburg. We spent the morning walking around the city with the best tour guide I've had on this trip (an old pensioner), and he would frequently stop in front of buildings and tell us about them. He was also one of the most understandable tour guides I've had. He spoke slowly enough to process what he was saying (even long enough to process chetirnadsataya veka = 14th century = .... 1300s), and had a good sense of what words we did and didn't understand. In the afternoon we walked around a bit more and went to a park, which was quite wonderful. After our tour ended, a couple of folks went swimming, and then while she was climing along some of the rocks on the shore, Olga, the organizer of our cultural excursion program, slid down the rocks and fell in the lake. It was hilariously funny (though not from her perspective), but her clothes dried before the bus ride back to Petersburg. That pretty much sums up this weekend. I suppose I could tell you about last week, though. Last weekend we had a trip to Novgorod, which is also really old, too. There was a big beach there, and some of us went swimming, which was incredibly enjoyable. I was trying to throw rocks from the river bed around with my foot, which probably looked pretty ridiculous. We also drank some of this delicious honey beer they sell at this tent next to the beach. Then, the highlight, or rather lowlight, of the week was that I happened to catch a cold. I brought five doses of Tylenol Cold along with me, which lasted about a day and half. My host family gave me some herbal tea that was supposed to help, but it tasted really awful, so I went back to the regular black tea. They also gave me some stuff, which I think works kind of like Vicks, but I opted for taking my Tylenol Cold instead. Wednesday, after school, I went to a drugstore and found some 'Antiflu' medicine, which has been working well, when I remember to take it. I then proceeded to go to a little grocery store and pick up some orange juice. My strategy for handling anything with cold-like symptoms is to drink orange juice. I mean, if I have orange juice, I can't be sick, right? The two don't mix! So I drank the bulk of a 1.5 liter box in about an hour. It was awesome. Oh, I also got my first sunburn here in Vyborg. After spending about 7-8 hours outside. And I'm not even that burned. What a deal! And in the spirit of 'pics or it didn't happen' (a CPAAG thing (a Ravelry thing)), photos will go up tomorrow, when I'm not paying for wi-fi access at Idealnaya Chashka. In fact the most difficult part so far was getting the giant 1375-yd hank wound into a ball. This was done by hand, Friday night. (I did listen to the seventh Harry Potter audiobook though as I wound, which I finished on a bus yesterday, incidentally.) It took probably around four or five hours, but as I encountered relatively few small tangles, and the entire thing never devolved into a giant mess, I would say it's been one of my least stressful hand-ball-winding experiences. However, my enjoyment of lace is making me feel better about that really odd burnt orange alpaca/acrylic purchase I made a couple of weeks ago. This would be the news of the week. I'll have more for you next week, but THIS is DONE! And it's awesome. I realize that I've been terrible about posting this week, so here's a discussion question to tide you over until Monday. I thought of this while walking to school yesterday. What is the ecological footprint of a bum? I ask because it seems to me that they've got to be pretty environmentally friendly people. I mean, if you don't have a house, that must rule out a huge portion of normal energy consumption levels. Furthermore, in Russia, they appear to constitute a large part of the recycling system. Rather than having recycling bins anywhere (it's very painful, but I've been having to throw away bottles and cans), the system seems to be that the bums pick them up off the street and out of the trash. (I don't know what they do with them, but I assume they're being recycled, otherwise they'd probably be doing something else.) I figure if I'm throwing stuff in the trash, the recycling is offsetting the bums' consumption, rather than mine. It kind of has this weird moral edge to it. I feel like people don't tend to think the highest of bums, especially when thinking about who does and doesn't contribute to society. But perhaps from the grandest perspective, they are some of the people who are damaging the world the least. I guess that's kinda cool. Speaking of people who are not damaging the world this summer, I hope you all know about the One Big Bike Movement? So, a few months ago, specifically January, I joined a group on Ravelry. (What is Ravelry? In a word, awesome.) The group is called Mission Possible 2008. The basic idea of the group is that knitters and crocheters have all of these projects sitting around that aren't done, that we should really finish, but sometimes we just start new things instead. The people who started the group decided that in 2008, we would each pick 12 projects to finish by the end of the year. Now we're about halfway through July, so I figured it's about time to check in on what I said I'd do. 3. legwarmers - now Mosey from spring Knitty 2008 - one leg done! 9. a bag for when I (hopefully) study in St. Petersburg, Russia this summer! Now. Number 2 should go quickly. And number 9 never happened, which is totally fine. (I did have a specific pattern in mind for that bag, but as I never purchased the yarn for it, I don't feel like not finishing was a big deal. There's actually nothing hanging around haunting my stash that was supposed to be in it, so there we are.) I imagine the legwarmers should go quickly once I'm around them again (they're not in Russia), and Blaze is definitely a project I was planning to make in the fall. The patterns need to happen to, and they will. HOWEVER. The prayer shawl will involve carving out some time. And the stuffed Totoro and the baby penguin will be super cute and all, but they're going to have some tedious bits, which I'm not really looking forward to. And the felted iPod case? I really should have made that in January. The back of my iPod has lots of little scuffs and scratches, but I never seem to get around to it. Basically, I'm looking at this list of 11 things I should really do in the next five months, and I really don't feel like doing that many of them, and the things I'm working on now, and the things I'm really excited about doing aren't on this list. But how freeing would it be to get that penguin done? And that prayer shawl? And those scarf ends? So I'm thinking, how much is it cheating to change my list this late in the year? Is that like trying to engineer my success or something? I don't want to cheat, but I don't want to be a complete failure. Also, I might have created the original list too hastily. Does it really make sense to have projects that I would just like to make at the moment (like socks and a bag and stuffed Totoro) on this list, rather than including parts of my stash that are really burdening me? Are there skeins of yarn that I would like to get rid of? It's just been the last year that I've really gotten into using nice fiber, so I haven't really ever seriously considered getting rid of some of the lower quality acrylics that I have. There's a lot of stuff I have that I'm not that excited about. None of it is stuff I've purchased recently. Perhaps if I don't want the yarn that I leave at home while I'm at college this year, I'll get rid of that in the spring. Maybe I'll get rid of it in December. Hell, maybe I'll get rid of it in August. Since I don't have any time tonight, perhaps I'll think this through and come up with a new, and more well-thought out list of things to finish. It can't be cheating. I'll be trying to do 11 things in five and a half months. Really four and half, because I probably won't have access to any of these things until I'm home. Which isn't really home, because it's a new house. For some reason, while I was checking my email this morning, it really hit me: that house I've lived in for 17 years? I'm never going back there. I'm getting a little teary thinking about it. My dad is having a blast today though. As the move is tomorrow, he's been getting to throw around his favorite word ('penultimate') around a lot recently. MORE PICTURES! All of these were taken between 11 p.m. Saturday night and 6:30 Sunday morning. It was the last night in Petersburg for the 4 week students, and so several of us went with them to the airport to see them off. Firecones! This was taken with the flash on. It really wasn't that dark out when this was taken. Though this photo shows well about the darkest it gets in the middle of the summer here. This is the bridge I walk across every day. Blagoveshenskii Most'. Blurry, but there's still some cool things in this photo. Like the Isakievskii Sobor' (big cathedral, which is one of the tallest buildings in the city and there's a building height regulation to keep it that way). The big open square in the foreground is in front of the Hermitage. Waiting to meet up with some friends, I walked along the Neva for a while and took all of these pictures. Then, I sat down here, down close to the river, and knit. I probably watched about 30 (mostly tour) boats come out of this little tunnel to wait for and watch the bridges go up. Well, it's a good thing I live on this side of the Neva, eh? This is one of the trees near the Hermitage, when you look toward Isakievskii Sobor'. Yes, there are glow sticks hanging in these trees. Taken at 6:15 in the morning. Looks like it's time to cross the canal and head home. Ulitsa Dekabristov! Hey! I know where we are! The Mariinskii, where we saw Gogol's 'The Nose'. This is basically the landmark I use to navigate myself when trying to get home from anywhere, but specifically the nearest metro, which is about 15 minutes away. I only figured out the lion bridge route last weekend; before that I just would wander around in the general direction of home and look for the Mariinskii and/or the Irish bar across the street. Ulitsa Pisareva. (My street.) That truck says 'bread'. Actually, it says 'xleb', which means bread. Actually, it doesn't say anything because it's a truck and trucks don't talk. I don't know if this picture is interesting, but I liked the sunlight on the building. The building I live in, in fact. Well! There you are. I bet your eyes are all feasted out now. Which is good, because no one is getting any more photos until next week, at least. Unless I remember to take a picture of my soon-to-be-finished cardigan. Ah, yes! The button hunt was successful! Did I mention that? Rebecca and Lauren and I went to the yarn store on Saturday, and then I bought buttons next door. I'm not telling you (or Ravelry) about the yarn I bought, not because I'm hiding it from my stash totals, but because I haven't yet decided what is going to be for other people, and what I'm keeping for myself. Though I'll probably keep the 100g/666m of burnt orange 50/50 acrylic/alpaca laceweight for myself. I'm still trying to figure out (1) why I bought that and (2) what the heck I'm going to do with it. I feel like that's a little too odd of a purchase to burden anyone else with... I only bought one other skein so far, but I think during my next free weekend (which is not next weekend, because next weekend is an overnight trip to Novgorod), I'm going to spend the bulk of a day poking around various yarn stores. Which means, like the true geek I am, I'll probably spend that Friday night at home, planning out my route! In other news, I watched part of Ken Burns' Jazz in Russian. It's super interesting, but I'd actually rather watch it in English. Not only would I understand more of it (though I'm understanding more than I thought I would, due only in part to my attempts to listen to the English they're dubbing over), but I would like to hear the voices of the people talking about the history of Armstrong and Ellington. They seem like cool people, and everytime there's a clip of Armstrong talking, I'd way rather listen to his voice than the Russian dude who doesn't have that cool rasp. OH! A list for you. It's short, but good. 1. On my way to the yarn store, near the bridge with the lions, there was a babushka with a little bread bag, and she was doing the normal throwing crumbs at the pigeons thing. Except there were about 40 or 50 pigeons, and they would all clump around the crumbs like 5 year olds playing soccer (football) follow the ball. 2. As I was walking along the Neva as the bridges were going up, I saw several people wearing headbands with glow-in-the-dark flashing devil horns. A couple of them even had related plastic pitchforks. Then I saw a babushka selling them. She was, of course, wearing a headband as display. Then, on a related note, this morning I read an article in a local paper (perhaps equivalent to the Sun Focus or something) about the only team in St. Petersburg to play American football. Now, I know you're reading this, Grandma, but you've probably figured out that we disagree on this subject, but WHY ON EARTH would ANYONE see that game and think 'oh cool we should play that', when their country is interested in good sports like real football and hockey. Also, they asserted that American football is like 'living chess'. ...Um, NO. I understand how people compare both to war, but I would say they're each like war in different ways. With football being the more about running around and knocking people over and chess being about strategy and brain activity. Well, yes. Isn't that a lovely note to end things on. It's been a while since me an Giblets seen a real pie. Lotsa imposter pies, like the pirog, which tries to fool you with it's puffy crust an fruity innards, but upon closer inspection we've determined that it's not actually made a pie. Then, some days when we're sittin' down for lunch, they give us a plate a this stuff that's supposedly pie. These 'pies' are individually-wrapped for your health and better concealment a the truth. The package proudly asserts it contains a 'choco-pie'. It's doubly misleadin', because we're sittin' at a Russian Table, so we're expectin' Russian food and we get 'choco-pies' an then they turn out to be unappetizing little coated spongecakey sandwich cookies. 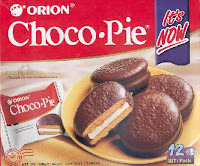 So, I stand up with my 'choco-pie' and heartily declare it's unpieness an then Giblets throws his at the wall, an it bounces off and hits Little Debbie in the back a the head, an she takes one look at it an says they're copying her an runs off to tell her mother an the U.S. Patent Office. Then someone suggests that we go to Stolle and get some pirog, which is like pie. But it's not. So I sit down and stare sadly at my half eaten banana. All I'm lookin' for is somethin with a normal crust, maybe made a graham crackers or maybe just pie crust, an normal pie insides, but I'm not seein' any pie in Russia. Musta ate it all back durin' the blockade. That explains it. Photos! So many photos! Because I haven't posted any in a long time. First up, we have some more photos from excursions around Petersburg. This is Isakievskii Sobor' (St. Isaac's cathedral). A couple of pictures from the walkway around the dome, showing some of St. Petersburg, and then the square in front of the cathedral. This one is inside Isakievskii Sobor'. This is an extremely colorful church, also with mosaics on the inside. The mosaics here, however, took many many years to finish, since (I think) each tile was placed individually. That's Nathan, Asja, and Tess (and Emily's head) in the foreground. Firecones!, inside the door of Yusupovsky Palace, where Rasputin was killed. He wasn't killed where the firecones were, though. The Hermitage from across the Neva. Then, one day, when I was walking home, there was a boat race down the canal, I guess. There were a couple of guys doing tricks, or at least doing the boat equivalent of popping wheelies, which always ended in a big splash, sometimes soaking the people watching from the sidewalks. Next, we have some highlights from last weekend (not the one we just finished, the one before that), which we spent in Pskov. Pskov is hecka old. First, the fortress and cathedral at Pskov. It's got centuries on North American historical structures. Honestly, I forget what this is. It's across the river from the fortress. Locks, across the river from the fortress. Couples come here and fasten a lock around the gate, and throw the key in the river. The river and main bridge in Pskov. Stone walls and grass just outside the fortress. An intriguing building not far from our hotel. I'm sure it was mentioned on the tour, but I'm pretty sure nobody remembers everything they say on the tours. The second day of the Pskov trip, we drove out into Pskov the region (having been in Pskov the city) and the bus dropped us in the middle of some fields. We walked through a big field, not really knowing what's going on, and then saw this. Another shot of the springs. Ignore that guy's feet. Then, Emma and Louis, the other two Oberlin students, went swimming. This was taken before someone accidentally knocked Adams' camera in the water. Ilya & Kalinda (who both left yesterday morning), and Emily (who's still around for four more weeks, like me). This is the monastery we went to after the springs and fortress. It was gorgeous, but since there were so many people (not even factoring in the monks) who were clearly there for non-touristy reasons, I didn't feel much up to taking pictures. This is all I've got. Another phenomenon in Russia (this particular photo taking place after lunch after the monastery, before the five hour bus ride back to Petersburg): there is a good number of stray dogs, and they're really friendly. Sometimes they just sit and people-watch, and other times they come over for some attention. Well, that's Псков. I think this past weekend (the one that just ended) merits another post.